PSYCHOMANCER signs with Orchestrated Misery Recordings! 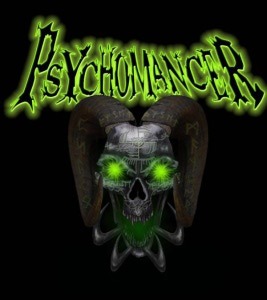 Orchestrated Misery Recordings is proud to announce the signing of Indiana death metal merchants PSYCHOMANCER, who will be releasing their new six-song recording entitled Inject The Worms in 2015. With a long and storied career, PSYCHOMANCER’S version of “brutalized” death metal has been a favorite in the Chicago/Northern Indiana region since forming in early 1998. This will be their first recording since 2007’s Butchered by Me, which was released by Rotting Corpse Records. Recently revamped in 2012 with a new line-up and blitzkrieging the area Illinois/Indiana/Michigan area with shows, the band consists of founding member Duston Bullard taking on bass/vocal duties, new blood Corey Blackstad on drums and guitarist Curt Hutchison on rhythm/lead. Inject the Worms promises to be more diverse, demon-tempered, and complete than their previous releases. With a sheer vocal attack and hints of melodic death metal riff-age, the new incarnation has forged six songs of atmosfear and heaviness with themes that are more than your typical “killing, cutting, maggots, killing with my knife.” The heaviness and aggression of Death Metal is there, but this is more a psychological way of mutilation, of treading the dark paths of life that bring you to face the elements of death. The music is still as heavy as you would expect with shattering blast beats and frantic double bass, a switching tempo pattern between fast paced and sludge-driven guitar, thundering bass and growling vocals; but there is also an added element of storytelling and a myriad nods to many metal genres knotted together intricately adding a depth to this newly evolved PSYCHOMANCER. The band is currently playing a few select shows, readying their EP release, already hard at work writing the next album as we speak, and hopefully will be in the studio again by 2015.